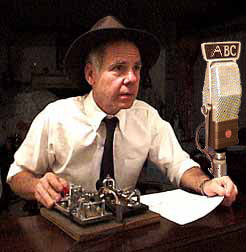 ...and a 1998 photograph of Tom Perera with the duplicate telegraph keys appears on the RIGHT. 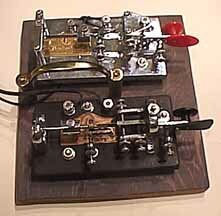 (RIGHT): I have carefully duplicated the unique TELEGRAPH KEY setup used by Walter Winchell in his evening broadcasts. The setup will be used in a Hollywood movie. 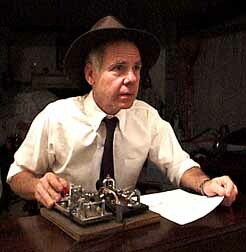 "Good evening Mr. and Mrs. North and South America and all the ships at sea....." "LETS GO TO PRESS"! CLICK HERE to go to an internet audio site. 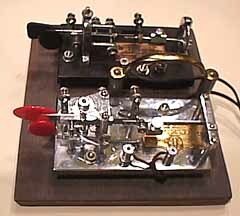 The telegraph Key in the foreground is a VIBROPLEX "LIGHTNING DELUXE". 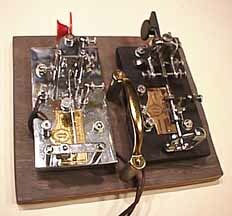 The key in the background is a VIBROPLEX "ORIGINAL". These keys were originally acquired by collector Steve Wilson. Pressing the lever to the right activates a vibrating mechanism which produces a long string of dots. Moving the lever to the left allows the operator to produce dashes manually. 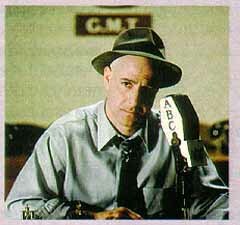 Click here for a look at actor Stanley Tucci as Walter Winchell. 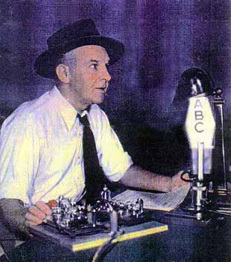 This is the photograph used to advertise the HBO special movie on Walter Winchell to be aired on November 21, 1998. The very top of the two bugs can be seen sticking up in front of Winchell's right arm. A full length wide screen movie is also being made about Winchell's life. Presumably, the same two bugs will be used.